These vintage gun ads will give you a good chuckle and show you just how much the world has changed in the past few decades. A lot has changed in the last century. Looking back in time at vintage gun ads is a great way to highlight just how different we are a society these days. In some ways, vintage gun ads remind us of a simpler time from back in the "good 'ol days." In other ways, though, they show us just much progress we've made. Either way, they can be pretty entertaining when you think about the reaction some of these gun ads would receive if they were published today! It's just not a "real" vacation without a .22 rifle and pocketful of shells, is it? That's my kind of Christmas: everybody gets a gun! Look at all those smiling faces! This vintage gun ad showing santa driving a car full of rifles and shotguns really shows how much attitudes towards guns have changed since the first half of the 20th Century. That being said, I'd be pretty darn happy if he showed up at my house on Christmas like that. A plate of cookies and a glass of milk in exchange for a rifle or a shotgun? Where do I sign up? This is a vintage gun ad that highlights an areas where I think things have changed for the better: gun safety. 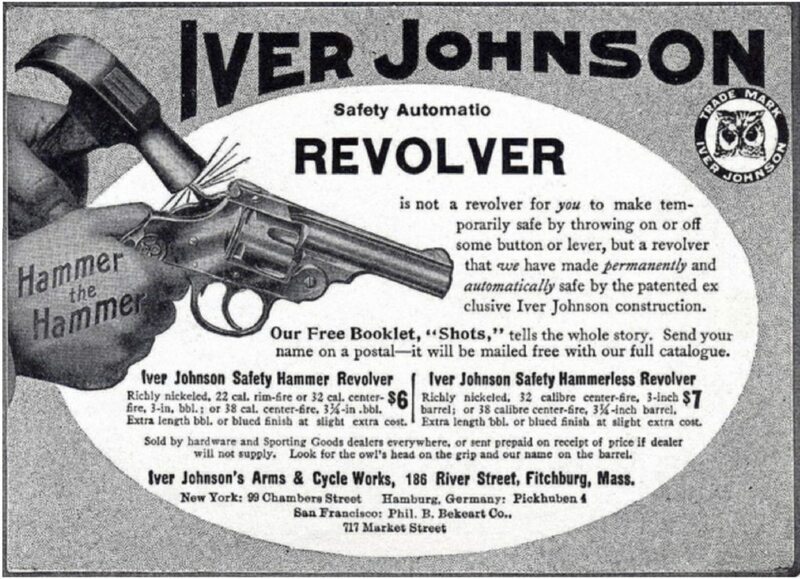 The Iver Johnson "Safety Automatic" featured a revolutionary "bar safety" prevented the gun from discharging if force was exerted on the hammer while it rested on a loaded cylinder (which is why cowboys always left the cylinder under the hammer empty). However, that is a standard safety feature on just about every modern production handgun. (That being said, I would never encourage anyone to "hammer the hammer" on any firearm, especially while it's loaded). 5. So Safe Your Kid Can Play With It? Continuing the theme from the previous vintage gun ad, this one is sort of funny if you've got a sick sense of humor. Other people will find this one cringeworthy. While it may have incorporated revolutionary gun safety features at the time, the claim that "accidental discharge impossible" with an Iver Johnson revolver is absolutely false. An no, I do not recommend letting your child play with guns. This is another example of a vintage gun ad that shows an area in which things have changed for the better, this time it's with women and guns. Women are one of the fastest-growing demographics in the sporting community and there are lots of highly skilled female shooters out there. There are many great self-defense handguns for women today, many of which are specifically built and marketed for women. Can you imagine the reaction women shooters would have if a gun company made an advertisement for a gun marketed for them that referred to women as helpless, dangerous, or hysterical? 7. Will it Be You? Or Him? Apparently, if you don't carry a .41 Smith & Wesson revolver, you're basically as good as dead. It's not a completely ridiculous comparison: similar skills are necessary to hit a flushing bird with a shotgun and shoot a moving target with a machine Gun. That's still not something you see very day though. When the old meets the new: it doesn't get much more 'Murican than a cowboy mowing down a bunch of attackers from his front porch with a Thompson sub-machine gun! This vintage gun ad advertising Egyptian AKMs came out of a Soldier of Fortune magazine in 1982 and was one of the very first opportunities for American civilians to own a genuine Kalashnikov rifle. The language in the advertisement is interesting because the average American wouldn't necessarily consider a Kalashnikov to be a "symbol of freedom" since they were used so extensively by our communist Cold War opponents. However, one man's terrorist is another man's freedom fighter. Additionally, these AKMs were the ones used in the 1984 movie Red Dawn, so they really were a "symbol of freedom" in that sense. 12. Look at Those Prices! $750 for an MP-43 and $950 for an MG-42!?!? I'll take two each! If the Solothurn Anti-Tank rifle for sale in that previous vintage gun ad was a little too rich for your blood (are you crazy? ), you can buy a 20mm Lahti Anti-Tank rifle or a 14.5mm PTRS Anti-Tank rifle for just $99.95 each from these guys. Apparently the M1938 50mm mortar has "many practical uses." The M1934 25mm Hotchkiss cannon is guaranteed 5,000 miles of tire tread. The Chinese 60mm mortar is a perfect "family heirloom for generations to come." This vintage gun ad is just all around awesome. That man looks pretty confident with his Winchester Model 54 in the face of that Grizzly Bear, which I guess is the whole point of the ad. The thing that really makes it funny is when you contrast it with the ad below. Even though it's fake, this is probably my favorite one out of all the vintage gun ads in this article. This ad for the fictional Lester's ammo lampooning the famous Winchester advertisements still offers a good lesson: no matter how great that firearm is that you're carrying, it's basically worthless if you don't use good ammo. I'll bet you've never seen an advertisement featuring a boy trying to stuff a revolver in his underwear before, have you? Since it's actually advertising for Jockey undergarments, it's not technically a vintage gun ad, but it's still pretty darn funny (and weird).